With her hands politely clasped within the voluminous sleeves of her costume, this is among the finest of the Han dynasty figures in the collection. Her distinguished but humble demeanor suggests that she represents a courtly attendant. It is a figure of extraordinary grace and eloquent simplicity, characteristic of the sophisticated Han style. Typically such models were made from moulds, the parts then luted together and the details finished by hand before the firing process. The figure was then covered with a white slip, which served as a base for the detail painting of which only traces remain. The Asian Collections, AGNSW, 2003, pg.81. This is a superlative example of Han figural art. The garment, with its flaring bottom, and layers of undergarments revealed at the "v" opening at her neck, are characteristic of everyday Han dress. Traces of red and blue (on her smart shoes) still remain apart from the white slip characteristic of these pieces. The hair, long and loosely caught at her back, is handled with the same attention to detail as the folds of the robes and the facial features. excerpt from Jackie Menzies, 'Early Chinese Art', AGNSW, 1983. cat.no. IX (cover illus.). Edmund Capon, The Connoisseur , 'Far Eastern Art in the Art Gallery of New South Wales', pg. 22-29, London, May 1980, 24 (colour illus.). 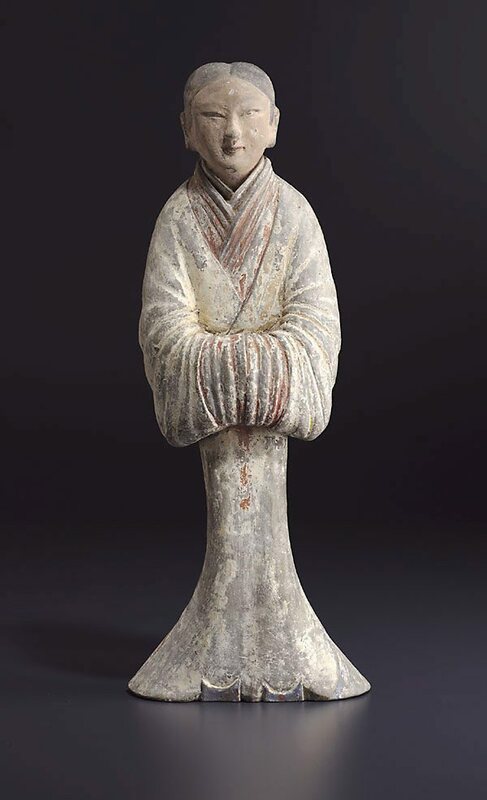 Jackie Menzies, Asian Collection Handbook, Art Gallery of New South Wales , 'Early Chinese Art', pg. 18-29, Sydney, 1990, 20, 21 (colour illus.). Judith White, Look , 'Journey to the heart of China', pg. 17, Melbourne, Jun 1999, 17 (colour illus.). The Asian Collections Art Gallery of New South Wales , 'Tomb Sculpture', Sydney, 2003, 81 (colour illus.). Early Chinese Art , Sydney, 1983, (cover illus.) not paginated. cat.no. IX. See 'Further Information' for text.